You were born in KweKalu, a place near Mae Sot, Thailand. You live there one year when the Burmese government attacks the poor camp. Your fifty year old grandma carries you to escape, with bombs and fire all around. Thank God, your life is not taken away. When the attack is clear, many people in your village go back, and they can’t find their houses. Instead they find ashes and death. What is it like to grow up in a civil war? To flee your homeland with your family? To live in a refugee camp? To trade all of the above for a new life in a new country - with the potential for freedom, but only if everything you know is left behind? These are questions we sought to answer with a recent exhibition of photography by Burmese refugee students in Indianapolis, Indiana. The photographs, taken over the past year as part of Project Einstein Indianapolis, a program focused on telling the stories of refugee youth through photography and digital media. When I was growing up in Indianapolis, I had never heard of the Southeast Asian nation of Burma/Myanmar. 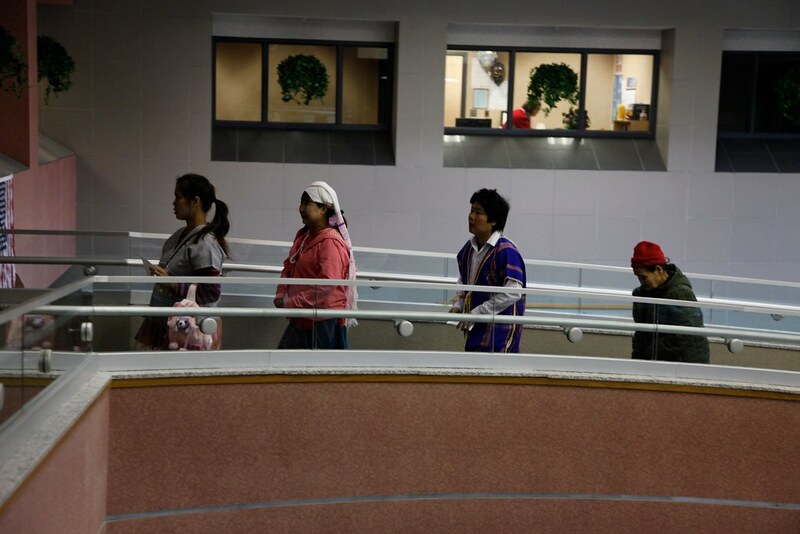 Although there was a small but growing population of Burmese people in nearby Fort Wayne Indiana at the time, I knew nothing about the country, where a military dictatorship has ruled since 1962. If I had, perhaps I would have learned how different my life was from the lives of Burmese people my age. Whereas I grew up in relative peace, with access to public schools and health services, many of Burma’s 60 million people grow up without either, and in many parts of the country there continues to be active warfare by the Burmese military against ethnic minority groups. More than 3 million people have been displaced by war, political oppression and economic hardship into the neighboring countries of India, Thailand, Bangladesh and Malaysia, where they live trapped in refugee camps or illegally as migrant workers. I didn’t learn about Burma until I went to college, studying at American University which has long supported the democracy movement in Burma. And it wasn’t till I traveled to the Thai-Burma border in 2003 and met Burmese refugees there that I learned about the growing ties between my hometown and people from Burma. By 2007, when Mark and I were learning from Burmese refugees in Thailand as part of a team from the Center for Peace Building International - research that inspired us to found Digital Democracy - there was a growing population of Burmese refugees who had been resettled in Indianapolis. Now, there are more than 5,000, representing primarily the Karen & Chin ethnic groups from Eastern & Western Burma, respectively. Because of my own personal journey of learning about Burma, it has been humbling to work with the Project Einstein students at Southport & North Central High schools as they have told their own stories through words and text. This past month, both have had the opportunity to showcase some photography and highlight their other talents at events at both schools. At Southport High School, Chin students and other English language learners performed in a concert on April 26, and a few of their framed images were on display in the atrium of the theater. On May 3rd, Karen students at North Central high school debuted their photos to fellow North Central students and the community at large, with a reception that was previewed by the Indianapolis Star. 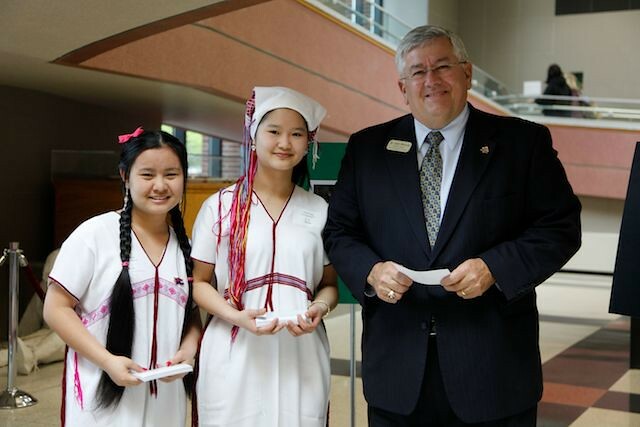 The reception was an evening of celebration and pride for the Project Einstein North Central students, which included students born in the US and Latin America as well 14 Karen refugees from Eastern Burma and one student from Iraq. 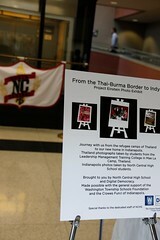 They dressed in traditional clothing as they welcomed a crowd of more than 200 to see their images and read their journey stories, which were printed on small cards that viewers read while walking up a ramp representing the journey from the refugee camps in Thailand to their new home in Indianapolis. In the atrium, photos were on display taken by participants of Project Einstein Thailand, depicting life at the Leadership Management Training College in the Mae La Refugee Camp. On the walk up the ramp, scenes of camp life were interspersed with facts about Burma, refugees in Indianapolis, and how to support new refugees through supporting Exodus Refugee services. At the top of the ramp the framed images were on display, and viewers could speak with the photographers and eat refreshments, including Karen food made by one of the photographer’s family. The reception was a truly special event, made possible by the work of many volunteers who helped hang the show, set up for the evening and invite viewers to come. Project Einstein Indianapolis is supported by the Clowes Fund, and a grant from the Washington Township Foundation paid for the printing and framing of the images. Most of all, I want to thank the staff and students at both schools who have made this program possible. They embody the idea of Project Einstein - that even though Einstein was a refugee, he could still do great things. Check out more images from the reception, and stay tuned as we organize a joint show for the students work this spring. Contact info(at)digital-democracy.org if you would like to purchase any of the students’ images.